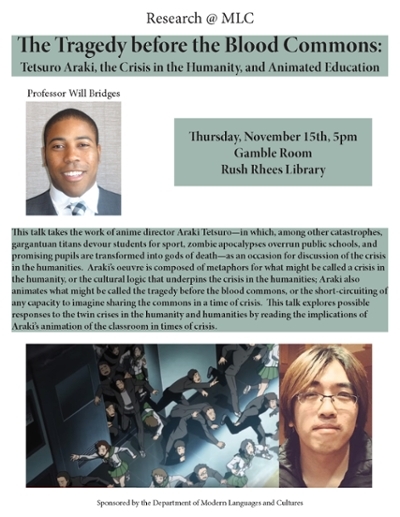 This talk takes the work of anime director Araki Tetsuro—in which, among other catastrophes, gargantuan titans devour students for sport, zombie apocalypses overrun public schools, and promising pupils are transformed into gods of death—as an occasion for discussion of the crisis in the humanities. Araki’s oeuvre is composed of metaphors for what might be called a crisis in the humanity, or the cultural logic that underpins the crisis in the humanities; Araki also animates what might be called the tragedy before the blood commons, or the short-circuiting of any capacity to imagine sharing the commons in a time of crisis. This talk explores possible responses to the twin crises in the humanity and humanities by reading the implications of Araki’s animation of the classroom in times of crisis.